I stumbled across this recent dvd release last week and felt it worthy of a review. Unsurprisingly, the title caught my attention, I am always on the look out for new films set in the past, particularly thrillers and especially those from the sixties and seventies such as the excellent ‘Baader Meinhof Complex’ and even better, the 2010 TV-mini series ‘Carlos’ which is the definitive work on Carlos the Jackal. 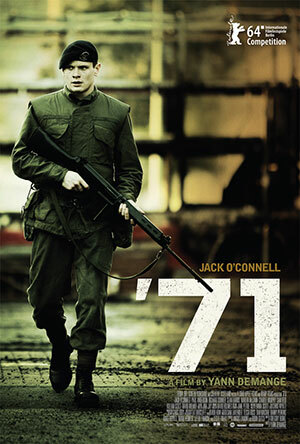 In the 1970s Britain was firmly ensconced in a seemingly hopeless and never ending conflict in Northern Ireland and this film is set during the troubles in 1971 with Jack O’ Connell playing the new British Army recruit whose hopes of a cushy tour of duty in West Germany are thwarted by a sudden posting to Belfast. The opening scenes capture the early seventies quite brilliantly, it’s an encouraging start and the sparse dialogue continues throughout the film. The film is not dialogue driven, the director, Yann Demange interspersed moments of great tension, such as the rioting with scenes of quiet drama as O’ Connell’s character hides in an outside lavatory whilst IRA volunteers scour the streets looking for him. As a piece of cinematography it is quite formidable, the bleakness of 1970s Belfast is well captured, from the tear away kids to the resilient housewives, the grim blocks of flats and burnt out cars but come the night and it’s borderline Tim Burton in Victorian-like foggy streets and dimly lit alleyways. ’71 is as much a story about the in-fighting within the British Army and the IRA as it is about them fighting each other. Personally I felt this could have been expanded upon, from the tension between the undercover Special Forces, the RUC and the British Infantry to the old guard of the IRA against a new, younger generation of recruits eager to fight harder. There is betrayal on both sides, we get a taste of how the British conducted their ‘business’ over there and the sense of disillusion it caused the young recruits on both sides but I felt myself wanting more of that and less ‘Rambo, get me out of here’. The central part of the film which is the escape/hiding/escape is the least plausible part of the film, it is, nonetheless, very well done and acted but the support cast offered far more. One had little doubt that ‘they’ really were how ‘they’ were and I suppose what I am really getting at is that I wished it had gone on for longer. I thoroughly enjoyed the film but there was something about it which nagged me and I could not quite pinpoint it until my brother mentioned the Carlos series to me today. This film deserves the ‘Carlos treatment’, a part-two in which the surrounding circumstances to the story become the real story.